Mumbai / Bangalore: A plan by Reliance Industries Ltd, or RIL, to build India’s largest port has been pushed back at least two years because the company has not got the land for it, said a person close to the development. “The state government has not yet transferred land for the port project to Rewas Port Ltd," the person said on condition of anonymity. “Unless the land is in our possession, work cannot proceed and the project cannot take off." “Even if the land required for the project is transferred to us today, the first phase of the port project can start operations only by the middle of 2012, as against the earlier date of October 2010," this person added. The first of the three-phase development for the Rewas port—that was estimated to cost Rs5,114 crore and involved building 10 berths with a capacity to handle 55 million tonnes (mt) of cargo a year—was to start operations on a 50-year contract beginning October 2010. The firm also proposed a container terminal with capacity to handle 2.6 million twenty foot equivalent units (TEUs) a year. A TEU, the standard size of a container, is an industry measure of capacity. A RIL spokesman said the original timeline cannot now be met. “The new time frame will depend upon the government transferring land," he said. As a fallout of the delay, the company has asked several employees to leave. The spokesperson confirmed it. He declined to disclose the number but said these people were in “assignment-based employment." The current economic meltdown has also forced the company to rethink. “Reliance still believes that infrastructure is a good business to invest and will watch the situation for a little more time before taking a final call on proceeding with the project," the spokesman said. Without the land, other aspects of the project are also in trouble. It has postponed awarding a contract to deepen the port’s channel to 14.5m, which would have been the biggest contract yet for such work at an estimated Rs1,800 crore. The depth has been planned to be eventually increased to 20m. Not surprisingly, raising funds have also run aground. The promoters wanted to borrow about Rs3,400 crore for the first phase of development. “But unless land is there, nothing can be done. Nobody will give us money," the person familiar with the development said. Rewas Port Ltd is 65% owned by various group companies of RIL. Mumbai-based maritime firm Amma Lines Ltd holds 24% stake in Rewas Port, and the remaining 11% is owned by Maharashtra Maritime Board, that oversees the development of state-owned ports. Land is key for the project to store goods arriving on ships, as well as for freight from factories and warehouses. Reliance has sought transfer of about 1,000ha of land owned by the Maharashtra Maritime Board and other state government agencies. The approval for a transfer has to come from the state government, but with the change in political leadership, it is likely that a go-ahead will be delayed till the general election due by May, is over. 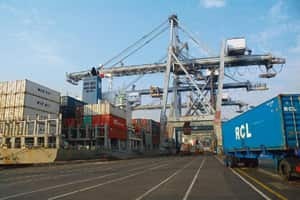 India, Asia’s third biggest economy, plans to raise the cargo handling capacity of ports to 1,590mt a year by 2012 from 757mt now, with an investment of Rs91,334 crore. Of this, Rs65,532 crore is to be invested by the private sector.